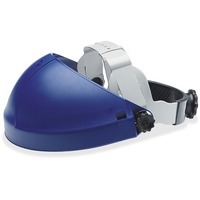 Deluxe headgear helps offer durable head and face protection to workers in metalworking, utilities, woodworking and many other industries. This combination includes H8A ratchet headgear and WP96 polycarbonate faceshield. Clear, molded faceshield provides high impact protection. High strength thermoplastic crown protector provides impact resistance. Five position crown strap and adjustable, 13 position ratchet suspension help provide a precise fit. Headgear requires protective eyewear sold separately. Recommended applications include facility maintenance, grinding, machine operations, sanding, welding, demolition, painting, blasting, assembly and cleaning.